Project obstacles and solutions: American Beverage processes tomato-based juices for their Bloody Mary mix. The floor of the processing room contains a drain that surrounds the vats. When the vats were cleaned and sterilized, the highly acidic tomato juice ate into the concrete, causing deep pitting. American Beverage decided to tear out the old drains and replace the flooring around the vats with epoxy finish on top of new concrete. Dennis Ott was hired to tear out the old drains and patch the floors. The new floors required that all the processing equipment be shut down and removed while construction was in process. Getting the floors completed and the units back up and running was extremely important. IMI suggested they use Aridus Rapid Drying Concrete for two reasons. First, traditional concrete would take up to 120 days to dry out so the epoxy finish could be applied. 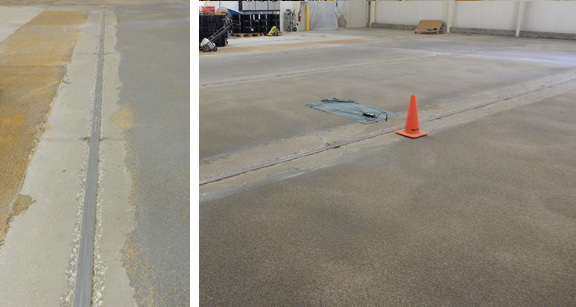 The customer wanted to be able to apply the epoxy finish 21 days after the concrete was poured. Second, the processing of the drink mix produces a lot of steam, that keeps the room very humid. Aridus Concrete would continue to eliminate water that may seep into the flooring after the room was fully functional again. Two trenches were cut into the old concrete to rebuild the drains. One was 10 inches deep and was filled with Aridus Concrete with an 8.5 inch slump. The other was 6 inches deep and was poured with a 6 inch slump. The temperature of the room was kept at 70 degrees F during the next 21 days. A dehumidifier was used to keep the relative humidity (RH) of the room at an average of 62%. Seven days after the pour, the 10 inch trench had an internal RH of 83% and the 6 inch trench had a RH of 80%. By day 14, the 10 inch trench had a RH of 73% and the 6 inch trench a RH of 70% - both well below the threshold needed to apply the finished flooring. The flooring contractor was able to apply the epoxy on schedule, 21 days after the concrete was poured. For more information on Aridus, click here.